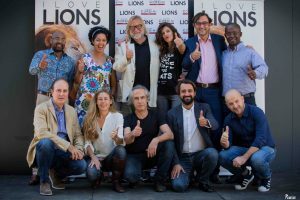 In October 2016, WildlifeDirect in partnered with Caffè Corsini and National Geographic Italia to launch the ‘I Love Lion’ campaign, to raise awareness of the dramatic decline of lions in Africa. According to the Kenya Wildlife Service, there are only about 2000 lions left in Kenya. 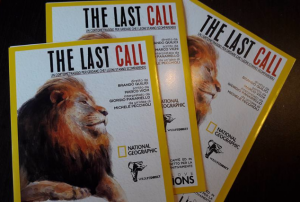 The campaign was launched with a short movie about lions, ‘The Last Call’ and Dr. Paula Kahumbu was in attendance. Since then, WildlifeDirect has featured two episodes on NTV Wild Talk addressing the plight of lions in Kenya. NTV Wild Talk is a groundbreaking series of wildlife programmes on Kenyan free to air television channel (NTV) and has been hailed for transforming public attitudes toward wildlife conservation. 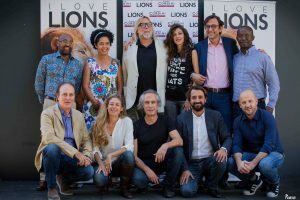 ‘Collaring Lioness Nyala’ is an episode that was aired during season four of NTV Wild Talk. In this episode, KWS vets dart lioness Nyala and put a satellite link collar on her at the Nairobi National Park. Collaring lions is a critical exercise that helps the KWS team to track and monitor the lions in the park. ‘Saving Kenya’s Big Cats’ is an episode that explored the plight of lions and threats that have contributed to their decline. Smriti Vidyarthi returns to the Masai Mara, where “African Cats” was filmed, to see how the Marsh pride is doing, following the poisoning and death of the leader, Bibi. NTV Wild program is a partnership between WildlifeDirect, Kenya Wildlife Service and NTV Kenya. The talk show is complemented documentaries from National Geographic, BBC Worldwide, Derek and Berverly Joubert, Alan Root, Simon Trevor, the African Environmental Film Foundation, the Disney Corporation among other award winning filmmakers.